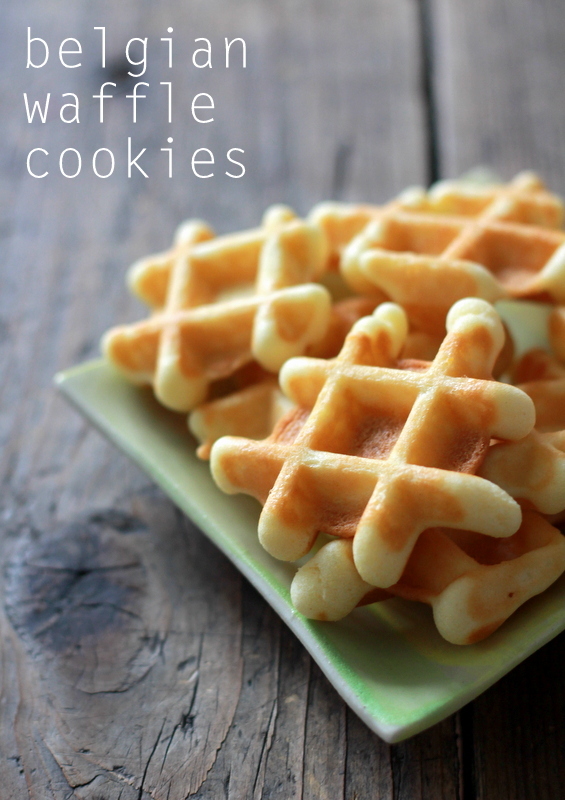 Today I have a great recipe for Belgian Waffle Cookies. These miniature wafeltjes are baked in a waffle iron and are so rich and buttery (the recipe calls for 400g butter!). My husband grew up eating these cookies (made by his grandparents) and is capable of eating them by the dozen. And now my kids as well. While making these our neighbours were calling over the fence to know what the amazing smell was that was coming from our kitchen. There is nothing quite like the smell of baking waffles (there must be a waffle inspired perfume out there somewhere). These keep for at least 3-4 days in a closed tin and are great to package up as a gift for someone special. We found the recipe for these waffles on the site of Jeroen Meus who is pretty much the Jamie Oliver of Belgium. Jeroen has his own cooking show, tons of cookbooks and a really great website full of recipes. Everything I’ve tried of his has turned out to be delicious and simple to make (favorites are Baked Cauliflower with Ground Meat and Bruschetta with Guacamole, Smoked Sprot and Tomato Salsa). 1. Gently melt the butter (make sure it doesn’t colour). 2. In the bowl of your mixer put in the flour and sugar. Add the baking powder, salt and the scraped out seeds of the vanilla bean (or the tsp of vanilla extract). 3. Mix on medium low speed and slowly add the eggs one at a time. Let mix for one minute then slowly pour in melted butter. 4. Cover bowl and put in fridge for at least one hour. 5. After letting the dough sit in fridge heat up waffle iron. Make small balls of dough and drop onto waffle iron (we did 4 at a time because we wanted them to be small but you could also do two bigger ones). Let bake until golden brown and remove from iron with wooden skewer onto a cooling rack. Store in covered container. Makes: a lot! We actually made these to sell at a fundraiser pajama run around a local lake in support of children with cancer. We set up our bake table with these waffles, chocolate cupcakes, Rice Crispie Squares and popcorn and tempted all the runners who passed by (the waffles sold out almost immediately!). The money made at the race was donated to the Associazione Bianca Garavaglia which organises activities for children in hospital. Whether it’s a craft workshop, clown visit or a pizza party it’s something that makes these kids lives a little bit happier and bearable. So come on, make up some of these waffles and set up your own bake sale in support of kids in need! Hmmm I can almost smell them! My mom used to make these kind of Belgian waffles too, I remembered she used karnemelk to make the waffles more fluffy. Yours look so delicious: no wonder they sold out so fast! I use karnemelk (which I’m pretty sure is buttermilk in English) in a lot of cakes and muffins. `It really makes baked goods that much better (no idea why though). Unfortunately you can’t buy it in Italy. You can substitute milk with a few tablespoons of lemon juice in it for buttermilk. Just put the lemon juice in the milk and let it sit on the counter while you do the rest of the recipe, and then add the milk when ready. They look so nice, I need to try then asap!! I’ve been meaning to get a waffle maker thing and I think this is the perfect excuse!! Once in London I went looking for buttermilk and asked a man where it was, and he took me to the fridge part and said; there is the milk and over there is the butter!! Every time I hear or read “buttermilk” I think of this man!! Hahaha so funny! It’s such a weird name for a quite “light” drink! Amazing to see these here – we call them Gauffres and my Belgian grandmother used to make us a big cake tin of them each birthday. Now I make them for my children and they LOVE them, just like we did. (and still do!) I recently made a big batch for my brother’s wedding in Zimbabwe – they were a hit. Oh, yum. 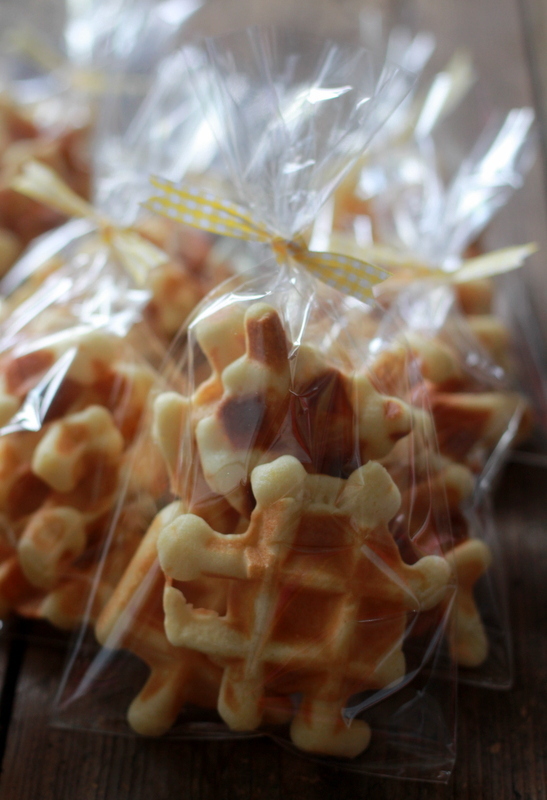 I never thought of making miniature waffles, what a fun idea! Don’t they look adorable! I am 100% sure they are yummy too! And the other ingredients are pretty much the same as you’re used to. One warning though…the recipe makes A LOT of waffles. So if you don’t need to feed an army you might want to cut the recipe in half. Thank you so much for your prompt replies!!!! I’m making them as Christmas gifts for my family and friends! Thanks, again, and I wish you and your family health and happiness in 2014! P.S. I love your blog. As your husband is Flemish, I will email you my grandmothers “koekebrood cramique” recipe. I grew up knowing it only as “koo-koo” bread. It is a tall, heavy, dense, mildly sweet yeast bread that smells like “Europe” when it’s baking. Sorry, that turned out to be a long “p.s.”! Looking forward to making these! Can you please recommend a waffle iron? The one I currently have is just a bit to deep and makes balls rather than small flat waffles! Thank you! So excited to see this recipe! My Belgian grandparents would make these cookies each Christmas. I do have a question, what waffle iron did you use or could you recommend? I believe the one I currently have has holes that are just too deep. Thank you. I actually have a really good quality waffle iron that I bought in Belgium years ago (the brand name is NOVA). I don’t know where you live but I would invest in a heavy stainless steel one that has the flip-over feature. I know in the States they sell the Waring brand which is supposed to be quite good. They might cost a little more but they last a lifetime! Good luck! For irons, visit Palmer out of West Newton, PA. The very best heavy duty handmade irons in the world. Could you add mini chocolate chips? Or blueberries? I think these would freeze beautifully. I’ve never done it but was thinking of making a batch to freeze for Christmas. I wouldn’t add blueberries due to the fact there is too much juice in them but I think mini chocolate chips might work. Next time I make them I’ll give it a try! Hi! I’m wanting to make these for my boyfriend for Christmas, and I was wondering how you would incorporate buttermilk into this recipe? Also, what type of waffle maker would you recommend? Thanks! I don’t think you can incorporate buttermilk into this recipe. It would change the consistency of the dough too much (it has to be very thick and sticky). Jillian do you know of a recipe which uses whiskey? Hello, Where can I get the waffle maker? So want to try these! Thank you! I don’t know where you live in the world but try any domestic electronics shop or online (amazon, ebay etc). Good luck. I’ve been looking on Amazon, but all the reviews are quite negative!! I don’t know who to trust…. Do these store well? how long would they last stored? what is the “baked” texture like? Is it like a waffle or like a cookie? They actually store really well. They definitely come out more as a cookie than a waffle. I think my mother-in-law stores them for at least a week.